NINETY per cent of the flowering plants on this planet cannot bear fruit if they are not pollinated by bees and birds. The rate at which bees are disappearing from their hives does not bode well for the future of such plants. 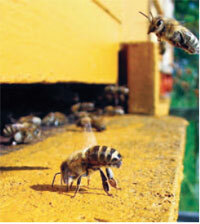 The colony collapse disorder (CCD) continues to mystify scientists and beekeepers alike. The precise cause is still unknown. A team from the University of Illinois perused the guts of healthy and infected bees for some answers. Entomologist May R Berenbaum and colleagues collected healthy bees from Illinois and infected bees from the east coast and the west coast of the US. Damaged genetic fragments were evident in the guts of infected bees. The fragments, called ribosomal RNA (rRNA), form cell components called ribosomes— protein manufacturing units. Parasites find it easier to attack a bee’s body by penetrating its gut wall. This explains why the team examined the bees’ guts. The rest of the insect’s digestive tract is covered on the inside by a thick, protective layer called the cuticle. After entering the body, the parasites take over the cellular machinery to achieve the replication of their own genes. The first step towards this is protein production. Hence the team concluded that the rRNA litter in the infected bee guts was from a pathogen overload. The next step was to confirm the connection between parasitic destruction and CCD. From the gut matter the team detected and identified genetic markers of eight parasites linked to the disorder: five viruses, one bacterium, one fungus and a single-celled protozoan. The parasites’ distribution varied between the infected bees from the east coast and the west coast. The common point was that the litter of rRNA was missing only from the healthy bee guts.